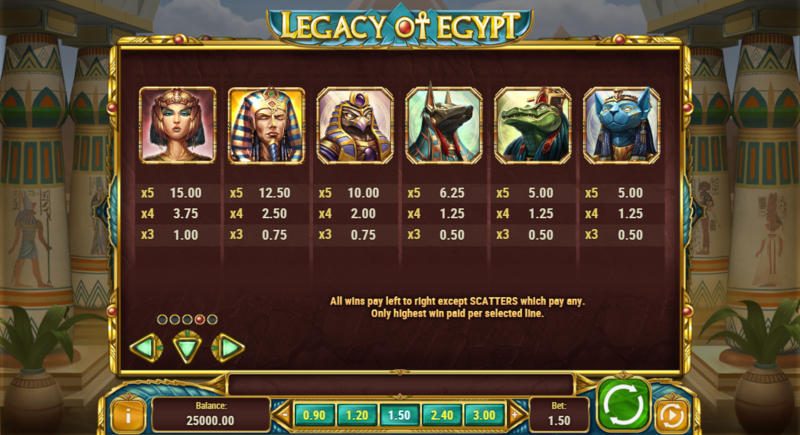 Go back in time to ancient Egypt with this slot in which gods and men play together. It is nicely made, with an RTP of 96.5% and some high volatility. We like this one. 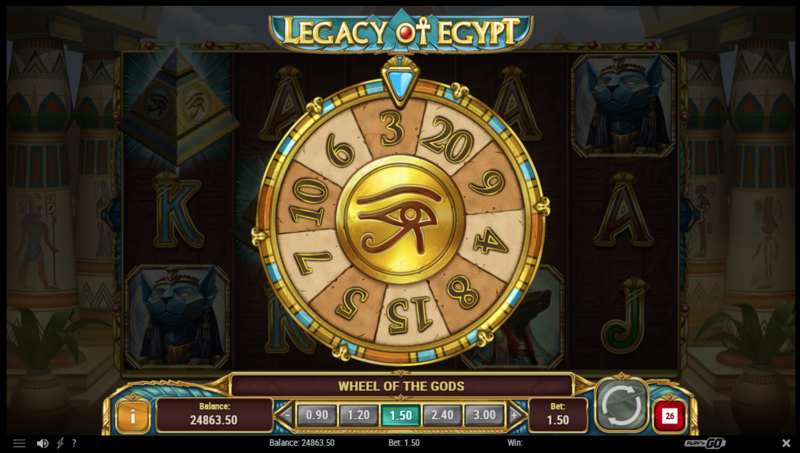 The gods of ancient Egypt have inspired many slot machines, but few have the graphical slickness of Legacy of Egypt from Play'n GO where the symbols for each god are rendered in high-quality digital paintings. The ancient Egyptian staples are all present. Pyramids, scarab beetles, pharaohs and the ace to jack symbols rendered in the style of Egyptian hieroglyphs. To go with this are the animal headed gods Horus (falcon), Sobek (crocodile), Anubis (jackal) and the cat-headed Sekhmet. It is a favourite theme of slot machines for a reason, and here it is done especially well. The graphics have clearly had some work put into them. As well as the digital painting style of the main symbols, an effort has also been put into a small animation for each symbol when it falls on a winline. Further attention has been payed to the accompanying animations for the win notifications and the way symbols are highlighted. The reel animations are smooth and blissfully fast making for more action in less time and sounds have been worked in to maximise excitement. For example, as each of the potential bonus-triggering scatter symbols fall, the music and sound effects build to generate tension. It is a nice slot, designed with great care. 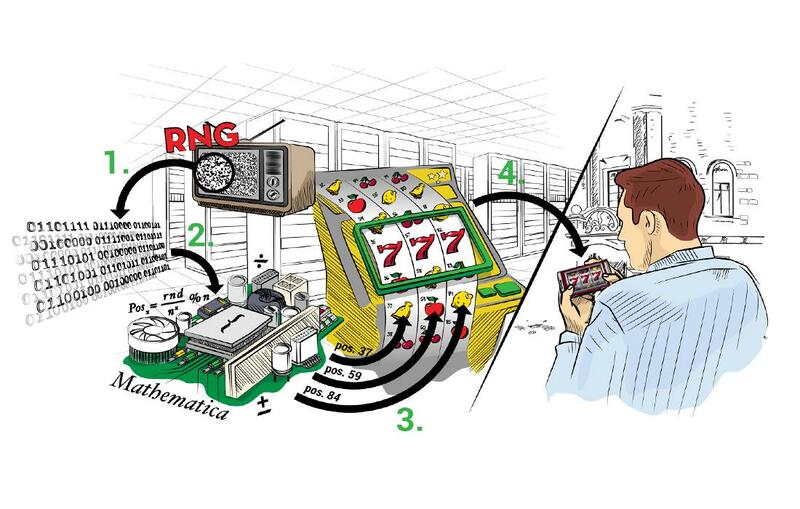 The basic gameplay is that of a five reel slot with thirty winlines. 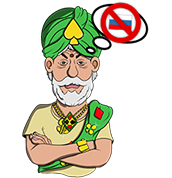 The bonus feature is a kind of fancy version of free spins, but is ultimately fairly simple from a player perspective. As such the gameplay works well and is well paced, but does not especially stand out. There are a number of special symbols. The first of these is the Wild symbol which plays as any other symbol except for the scatter symbol. As well as playing as a Wild symbol you can also win a nice payday by hitting them left to right on a winline. 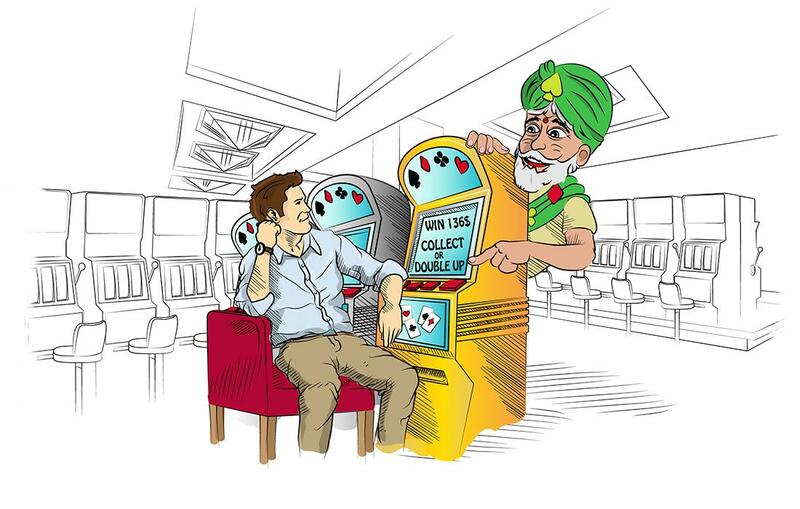 From thirty times your bet per line for three in a row up to five-hundred times your bet per line for five in a row. The Scatter pays out a flat five times your bet per spin if you hit three or more of them and will also trigger the free spin bonus game. 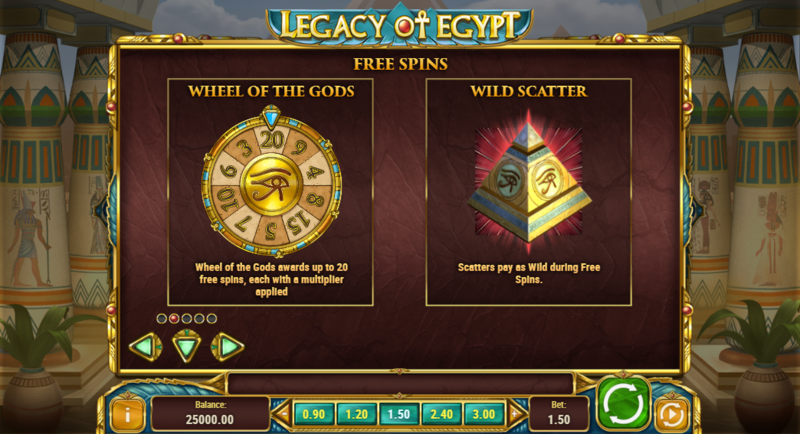 The number of free spins during the bonus game is determined by spinning the Wheel of the Gods. This awards between three and twenty spins with each spin then assigned a random multiplier as well. 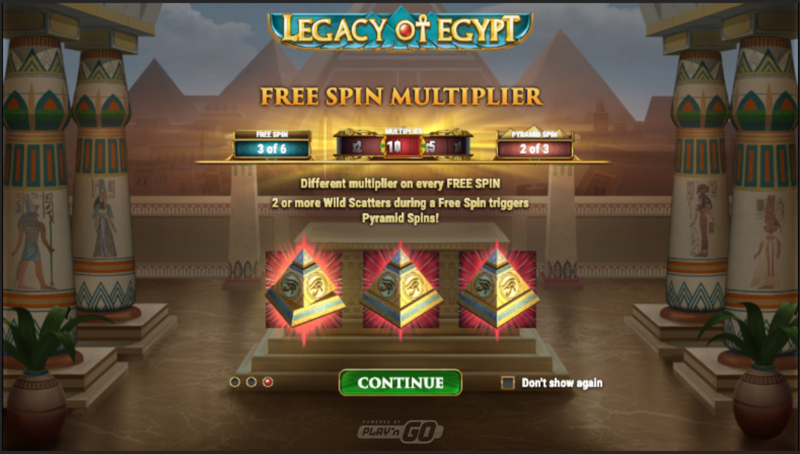 Hit two or more Scatters in one free spin and you trigger a new form of free spin called Pyramid Spins. 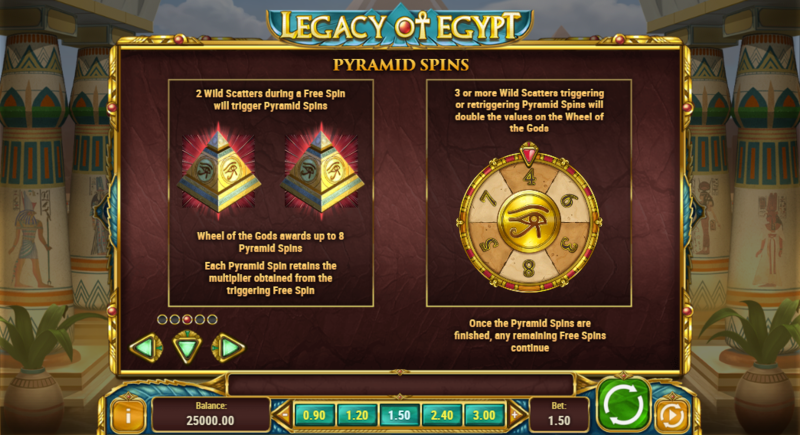 The Wheel of The Gods will award up to 8 Pyramid Spins. You then play the Pyramid Spins then return to any unused bonus spins. During the Pyramid Spins if you hit two Scatters you retrigger the Wheel of the Gods. If you hit three Scatter you retrigger the Wheel of the Gods, but with all the values on the wheel doubled. 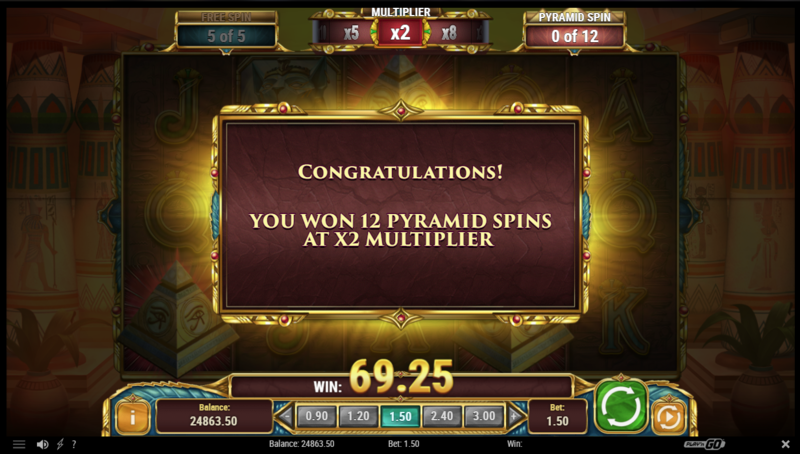 Pyramid Spins all have the same multiplier as the Free Spin on which they were triggered. 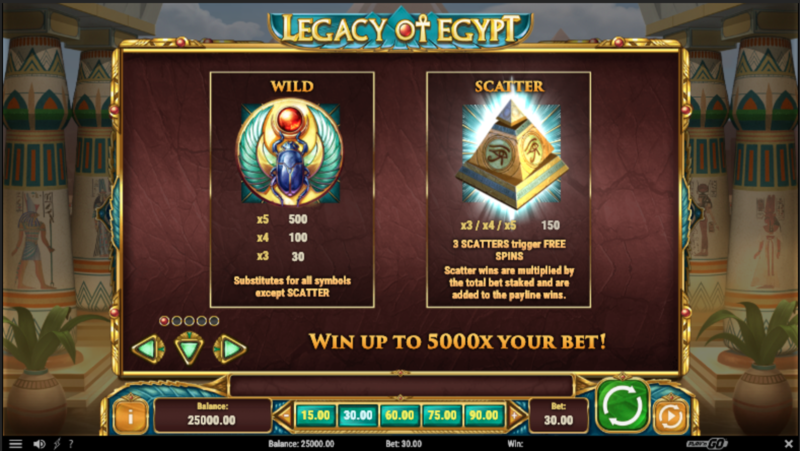 A run of retriggered spins and a good multiplier can make for huge wins capped by the slot at five thousand time your bet. During the free spins the Scatter symbols also play as Wilds. The RTP of this slot is 96.5%. This is a decent half percentage above our yardstick of 96%. The site we tested had a bet ranging from €/£/$0.30 per spin up to €/£/$90.00. With a maximum win of five-thousand times your bet, and the potential for huge wins in the rarely triggered bonus round, this is a high volatility slot. With a reasonable RTP and high volatility, this slot works well with our favoured strategies. Add to this the excellent design and fun gameplay, this is a slot we can recommend.